Think you don’t have anything to sell online? We respectfully disagree. We believe ecommerce is for everybody. obvious ways you can use ecommerce. But for the rest of us, ecommerce seems like something we don’t need. I’m just a blogger, why would I need ecommerce? I work at a nonprofit, we have nothing to sell. I’m a freelancer doing service-based work. I don’t need ecommerce. We respectfully disagree. We believe ecommerce is for everybody. Making money online is where everything is moving. It’s been going that way for a while now and it’s only going to continue. Ecommerce can enable everyone to make money online. Most people think ecommerce isn’t for them. They don’t have a store. They don’t have anything to sell. Ecommerce is for the Amazons of the world, right? Wrong. Ecommerce is for everybody. There are so many ways everyday people can and should be making money online. It could be a new opportunity you’ve never considered, something you’ve always wanted to do or simply a shift in how you do business. It could be such a subtle change you’ll wonder why you never thought of it before. It could also be ground-breaking. Let’s be honest: Checks, paper money and steady paychecks are on the way out. Direct deposit, automated payments, online billing and multiple income streams are the new wave. It’s time you embraced ecommerce. Even if you have nothing to sell. It can mean local businesses going global, nonprofits finding new donors, freelancers who take billing online, creators who realize they have something to offer the world. Ecommerce is for everybody. Including you. So how does ecommerce work for everybody? Let’s start by looking at several specific situations. They might not apply directly to you, but we think you’ll start to see some ideas that can work for you. And if not, don’t worry. After these specific cases we’ll cover the big opportunity for everybody. Everybody understands big shops like Amazon doing ecommerce. That’s what Amazon is. And it even makes sense to see big stores like WalMart, Target, Best Buy and others doing ecommerce. But is ecommerce really for local businesses? Yes! Everyone throws up their hands and bemoans how the Internet giants are killing brick and mortar stores. But local businesses aren’t going away. They just need to shift their focus to compete with the new digital reality. They need to think local and global at the same time. Ecommerce can do the same thing for the local business that it did for Amazon. The Internet destroyed geographic limitations and that made Amazon so successful. Local businesses are inherently local, but they don’t have to be. Instead of worrying about bricks and mortar, how about embracing bricks and clicks. Do both! Local businesses can have the best of both worlds: They can be the local institution, connecting with the immediate community, but they can also have a global reach, selling products worldwide. With geographic limitations gone, imagine the potential customers. Ecommerce can be a major boost for local stores. Amazon may have the logistics covered down to the tenth of a penny, but they still lack the style, fashion and attitude of a good local shop. Take your greatest strength and magnify it with the power of the Internet. Don’t let your store be limited by geographic distance. Take your style worldwide. It’s not all about going global either. Just because you’re busting down the limitation of distance doesn’t mean you’re neglecting your tried and true local customers who put you on the map. Going online can mean a better experience for your local fans. Now they can shop 24/7. Show inventory online and allow purchase for pickup. Going global should mean better service for locals, too! Sell more stuff, more efficiently and have more time to do what you do best. This may seem like a weird sector for ecommerce, but why not? Ecommerce is all about greasing the wheels of transactions, making it easier to sell. Couldn’t manufacturers benefit from that? Maybe it’s making it easier to place orders or selling off old inventory. And if you think manufacturing is too complicated for ecommerce, think again. Printing is notoriously complicated, yet print shops sell online all the time. They’ve found ways to simplify the process and add a layer of proofing to make it all work. Manufacturing has taken a big hit recently, especially in the United States. If you’re going to succeed, it’s time to try new ideas, shift into new markets. Ecommerce could be just the opportunity you need. Pizza Hut pioneered online ordering back in 1994, so don’t even try to say restaurants can’t do ecommerce. It might be online ordering with pickup or delivery, or even shipping baked goods or frozen treats. People will go through a lot for good food. It might also be more about the brand than the food. Some restaurants sell branded merchandise. Ever hear of Hard Rock Cafe? You might not have global appeal, but you might have enough to sell a few T-shirts. Why do nonprofits need ecommerce? Just because you’re a nonprofit doesn’t mean you don’t make money. Nonprofits still need income. In some cases, ecommerce can offer nonprofits new income streams. First and foremost, ecommerce allows nonprofits to accept donations online. That can be huge. Rather than losing money to credit card processing fees, the ease of online donations can actually boost income and bring in new donors. Score. Instant: No waiting for checks in the mail, no trip to the bank to make deposits. The transaction takes place immediately and processing begins right away. Available 24/7: Your supporters can donate whenever they want. No call center hours to worry about. No Staffing: There’s no extra staff time to facilitate online donations. Once you set it up it’s all automatic. Recurring Donations: Instead of simply accepting one-time donations you can encourage supporters to set up recurring donations. They can set up weekly, monthly or annual giving that automatically makes a donation. This can be an easy way to encourage a larger gift—$10 per month is easy on the wallet but adds up over the year. Donor List: It’s easy to capture member data online and build your donor list. Opt-in subscription checkboxes can quickly and easily add donors to your email list. That helps build a donor list that’s easier to track and ultimately more effective. More Options: You can give more options, which can encourage more donations. Accept credit cards, PayPal, Dwolla, bank transfers and more. Make it easier for people and let them donate however they want. If you’re going to do online donations, you’ll want to get the most out of them. You can’t just add a donation page, bury it on your site and expect the donations to roll in. Like any marketing effort, you’ll need to put some work into the rollout. Prominent: First, you need to make your donation button prominent. It should be part of your main menu or otherwise easily accessible from every page. Eager donors shouldn’t have to hunt for it. Simple: Keep the donate form simple. You don’t want to require too much information. It’s important to grab an email address and add people to your list if you can, but each extra step or field in a form is like a roadblock. Answer Questions: Transparency is important for donors, so make sure you’re answering questions and confronting any confusion with online donations. Let people know where donations go, make it clear if the donation is tax deductible and if you send a receipt. Trustworthy: You need to prove you’re trustworthy. Provide links to financial accountability information, like annual reports or Form 990s. Security: Use the top notch SSL certification (it’s what gives you the ’s’ in https://), even if it’s not required. It’s a good way to protect customer data and the top SSL certificate will build more trust with your donors. Prove It: People donate to nonprofits when they believe in the mission and see real results. An important way to encourage donations is to prove you’re doing what you say you’re doing. You should have some sort of news or reporting section on your site where you can talk about your accomplishments. It doesn’t have to be a lot of patting your own back—it could be more of a celebration. But show people their donations are doing good. It’s another way to build trust. Noticing a theme there? A good way to encourage more donations is to build trust. This should be foundational stuff in the nonprofit world. But it’s important to remember to include all those pieces when you add the online donation component. Another approach is to take your donations up a notch. Instead of just accepting donations, offer more for your donors. Recurring income is always a good way to go and offering subscriptions or memberships can be simple ways for nonprofits to encourage recurring giving. It could be a “suggested but not required” subscription to your newsletter or a membership that gives donors special access. Another approach is to encourage donations with a gift catalog model. You make it clear exactly how much donation dollars help by matching them up to specific things. Oxfam has done this for years by allowing you to give gifts of livestock. Matching a specific gift to a price tag can make giving more concrete in donors’ minds. What’s more engaging? $50 worth of unspecified aid to a needy family or a live goat, a living gift that keeps on giving? There’s a story with giving a goat that will resonate with donors. Ecommerce for nonprofits isn’t just about accepting donations. Nonprofits have other needs, like event registration. You could sell tickets online and simplify things for everyone. And you don’t have to be a huge organization to make ecommerce for events work. It works just as well for small events as big ones. No more mailing checks or having that one poor person toting around an envelope stuffed with cash and checks for weeks on end. Online event registration makes it easier to track numbers, limit attendance, and raise or lower prices as needed (early bird deals, last minute discount, late comer price increase, etc.). You can also send tickets via email and not deal with the delay and expense of the mail. And of course nonprofits can sell stuff just like anyone else. We’ll talk more specifically about what you can sell and how to do it in later chapters, but there are tons of options for nonprofits. If you create any kind of content there are ways to gather that material into a product you can sell. Letters from a founder, blog posts from a traveling worker, articles from a CEO or sermons from a pastor could all be turned into ebooks. If your organization has done any events or conferences with speakers you could be creating DVDs or selling the videos online. Nonprofits have a tendency to give things away for free. That can be a great strategy to get your message out there, but not everything has to be free. Maybe those blog posts or online videos are free, but when you collect them into an ebook or a DVD, you charge for it. You’d be surprised at how willing people are to pay for content, even if it’s available elsewhere for free. People are more than willing to support your organization and they’re also willing to pay for the convenience of getting everything in one place. All of these options can be newfound income streams for your organization. As the unsteady economy of the past few years has shown, that kind of diversification can be an important foundation for the future. One sector that’s quick to dismiss ecommerce is the service industry. So often services are performed in person and that makes online payment seem unnecessary. Why pay online when you can conduct the transaction in person? That’s a fair question, but another fair question is why force a transaction in person if you don’t have to? Sometimes offering the option of paying online can make things easier. Suddenly the in-person experience doesn’t include the shuffle of credit cards and signing, but can instead focus on people. Services are all about people, so why not focus on them? It could be part of your brand that you’ll handle the money later or people pay up front—both handled easily online—so you can spend all your time together giving the best experience possible. Ecommerce could also be a simple way to offer gift certificates or other extras. That might be something you’ve never thought to offer, but it could make an ideal gift for birthdays, holidays, thank yous, etc. Not every service is conducted in person. There are so many services where the work happens when you’re not there, like lawn mowing, or across distances, like web design. These services could benefit big time from ecommerce as a way to handle payment. Simple: There are a lot of services that don’t happen in person and online payment would be so much easier than sending bills or trying to connect in person. What a pain when the paperboy has to come around collecting payment or the kid mowing your lawn has to come back because you weren’t home. Why bother? How impressed would you be if the local kid who mowed your lawn had a website with online payment? That’s a kid who wouldn’t be mowing lawns for long. Speed: Online payments for services can be faster and more efficient. There’s no need to send bills and payments back and forth in the mail, then deal with checks you need to cash. Payment is immediate. Go Green: Online payments mean no paperwork. You’re not printing out invoices, stuffing them in envelopes, mailing them out and your customers aren’t writing checks and mailing paperwork back. All that paper going back and forth takes a lot of energy. Interaction: Paying online can mean a better experience in person. You don’t have to focus on swiping credit cards and can instead focus on people. Have a conversation with your customers and be more personable. Customers will remember these good interactions, you’ll form relationships and they’ll be more likely to come back. Recurring Payments: A huge bonus for online payments is when you have consistent payments due every week or month. With an ecommerce system you can set those payments up automatically. That means even less paperwork and more efficiency. Your customers don’t have to remember to make a payment and you don’t have to spend time following up and making sure payments are made. Online Access: If you set up your ecommerce system the right way you could offer your clients online access to payment history. Let them see past invoices, edit recurring payments and more. You could even offer membership style offerings, giving them access to additional content. It might be something simple like a secure place to post policies or exclusive offerings available to clients. An accountant may have a PDF with info about collecting receipts for taxes. They want to make it available to their customers without giving it to the world. A membership solution would be perfect. More Sales: Encourage more sales by offering your services as gift certificates. A free hour of massage would be an awesome gift, but so would a dog grooming session, lawn mowing or a guitar lesson. Your best customers would love to share your skills with their friends. The benefits could help so many service professionals, including consultants, coaches, therapists, dog walkers, lawn mowers, cleaners, plumbers, designers, accountants and so many more. Imagine a team of local babysitters who set up a website for scheduling and payment. How cool would that be? Ecommerce doesn’t seem like an obvious necessity for a lot of services, but it could be huge. It makes things easier for you and your client, and makes you stand out from the competition. Ecommerce really is for everybody. So ecommerce can work, even when it doesn’t seem obvious.But the real opportunity for ecommerce is an entirely new income stream. This isn’t obvious either—it requires a big shift in thinking. Ecommerce enables you to sell stuff, even if you don’t think you have stuff to sell. Ecommerce greases the wheels of transactions, and that means the ability to sell stuff you never thought you could sell before. It’s the glory of digital goods that makes everyone into publishers, producers and record companies. It’s the long tail that makes it economical to sell a few things and make a little income. Success is no longer defined by bestsellers. You can sell a handful of copies, earn a little extra income and do just fine for yourself. That’s what we mean when we say ecommerce is for everyone. There is opportunity for everyone. It may not be replacing your current job or turning you into the next Amazon, but it’s worth a look. Creating and selling stuff is a big step forward in diversifying your income and joining the creator economy. We think it’s something everyone should think about. Why Should I Sell Something? That’s a lot of nice talk from a company that creates and sells things. Of course we think it’s a good idea. But if selling products isn’t your primary business, why should you waste the time looking into it? Why is selling something such a good idea? Great question. We’ve got a whole bunch of reasons. Ready? Welcome to the creator economy. Gone are the days when people punch the clock and put in their hours at work. Now we create things. Now we work for ourselves. It’s a massive shift in thinking. Your primary source of income might be service based. You perform a service and get paid. But the creator economy means you can also create products based on your service and generate extra income. You can find a way to package what you do and boost your income potential. The entrepreneurs in the room are drooling. You only have so many hours in the day. You can only rack up so many billable hours. There’s a limit to how much money you can make. The income potential of your company is ultimately limited by people and hours. If you can find a way to package your service into a reproducible product, like an ebook or software, then you can move beyond those time-based limitations. Selling stuff online can be like having a second job without having to put in the hours. You work the initial hours to create it, but then it keeps making money for you regardless of how many hours you put into it. Big, rich companies don’t leave money on the table. They see the value in something and find a way to make money. You need to start thinking like an enterprise. The stuff you create is valuable. You love it, so you don’t want to think about it this way, but it’s a commodity. Find a way to package it and charge money for it. All you’re really doing is monetizing your assets. Use some fancy business lingo if that works for you. But get on board. Make your assets work for you. A big reason you should sell your own stuff is because it’s an income stream that compliments everything else you do. If you accept advertising on your site you’re ultimately pushing people away. If you do referral income with affiliates you’re also pushing people away. These might be fine ways to make money, but they’re income streams that work against you. Instead of using your space, energy and effort to make money for other people, make money for yourself. Put that space and bandwidth into getting people to buy your own stuff. It keeps people engaged with you. It keeps them on your site and ultimately in your sphere. You’re earning money and reinforcing your brand. Win, win. If you want to make some money you’re going to have to take some risks. Creating stuff involves a lot of risk. But there’s also a lot of reward. Just ask Mark Zuckerberg or J.K. Rowling. It used to be that creating stuff required sharing the risk and reward with a publisher or other backer. Someone would share the risk with you to create whatever awesome idea you had. But in order to get that backing, you had to share the reward. Publishers, record companies, producers and more gatekeepers got rich with this model. Some creators also got rich, but a lot of creators were deemed too risky. But today the Internet has made it possible to assume the risk yourself, or at least spread it among the crowd. Author Hugh Howey found success on his own by selling his books in the Kindle Store. When the publishers came knocking he sold the print rights to his hit novel Wool but kept the digital rights for himself. The publisher couldn’t offer anything that he couldn’t already do. The success of Wool was a big risk that Howey took on his own. Now he’s keeping all the reward for himself, as it should be. All the Kickstarter and Indiegogo projects flourishing today are an example of the risk being spread out. The giant gatekeepers aren’t the only ones who can take on risk these days, and that means all the reward isn’t locked up in their greedy fists. There’s more reward for creators like you. So the bottom line is you should create and sell something because the risk/reward model has been flipped upside down. There’s not nearly as much risk to create your own stuff and the reward can be all yours. It’s a tough world out there. After the past few years we all know the nosedive the economy could take at any time. And no matter how well the economy is doing, you could still lose your job. You could lose that big client. Your traffic could disappear. You never know what’s going to happen. There’s very little security out there. Which is why it’s important to take care of yourself. Cover your bases by having multiple income streams. Selling a book probably isn’t going to replace your salary, but it’s a nice trickle that can provide some semblance of stability. When things start getting ugly, you’re going to want every bit of stability you can get. It’s a little extra to keep you going or stop the worries. It’s an additional income stream that might give you the security to try something new or take a vacation. Nobody is reading your blog posts from 2009. But there’s probably good stuff there. Just because it’s five years old doesn’t mean it’s worthless. You could repackage it and help people rediscover it. Making content easy for people to find by repackaging it makes it worth paying for. You should create something because it’s an easy way to make the most of your content. In some ways it’s even an environmental approach: Reduce your work, reuse your stuff, recycle your income. And that’s something everybody can do. Back in the day all anyone could talk about was the shift from brick and mortar stores to online stores. Back then they presented a dichotomy, while today it’s not one or the other, it’s bricks and clicks. But there was another shift that happened without as much hoopla, the shift from physical to digital products. It started with Napster and mp3s, but it became legit with iTunes. It continued with YouTube, Hulu and Netflix streaming. Then with the iPhone came the app store and a new way to buy software. First it was just for your phone, but pretty soon the App store became the primary place to buy all software. The Kindle is doing the same thing to bookstores. CDs are going the way of the cassette. The days of DVDs, while still strong, are numbered. Apple’s MacBook Air laptops don’t even come with a CD/DVD drive of any kind. Ebooks are now selling as many copies as print books. None of these things will entirely disappear, but digital products are a force to be reckoned with. That shift from bricks to clicks is big. It’s been slow and subtle, but it changes everything. One of the biggest changes with digital is that storage is no longer an issue. Physical stores have a vast distribution system that involves warehouses and semi-trucks and relies heavily on the Interstate Highway system. Amazon has multiple warehouses and a close relationship with the U.S. Postal Service to deliver their goods to your front door. They’re even talking about delivering goods via unmanned drone, making everybody scratch their heads and check to see if they’re reading an article from The Onion. But digital products don’t need any of that. That makes it easy for anyone who’s not Amazon to sell their own stuff. Back in the day an author trying to make it on their own had a garage full of books and boxes they sold out of the trunk of their car. They had to worry about inventory. When you go digital there’s no such thing as inventory. That takes care of one of the major complications of running a store, which puts ecommerce within your grasp. The other major bonus of digital products is that there is no shipping. You don’t have to worry about packaging, boxing and shipping products. Customers don’t have to worry about paying for shipping—and best of all—don’t have to wait for their goods to arrive. With digital products you get instant gratification. Instant delivery means you can satisfy demands immediately. Not only do customers not have to wait days for what they want to arrive, they don’t even have to wait the 20 minutes it would take to drive to the store in their car and buy what they want. Digital is instant. While all of those things make digital products easier to sell, one of the most interesting oddities of digital products is the economics of production. There’s no quantity with digital goods. They’re digital. You can make as many copies as you want without any effort. Can’t do that with physical products. No matter how cheap production becomes, there’s still a cost to create a physical product. With digital products the cost of storage and transmission is so infinitesimal it’s hardly worth mentioning. That makes for curious economics where it literally costs nothing to create more merchandise to sell. While the price of a book will need to include creation, production, printing and distribution, an ebook will only include creation. And since that creation cost can be divided over however many books you sell, it becomes increasingly small. What all of this means is there’s more money to be made with digital goods. You can have an entire store of digital goods without ever bothering with warehousing, inventory, fulfillment or shipping. It means you can focus on creating what you have to create and then selling it. Simple. It doesn’t mean you can’t still do physical products or do both, it just means there are some big advantages to digital stuff. A perfect example of the oddity of digital goods comes from Guy Kawasaki. A tech company wanted to buy 500 digital copies of one of Kawasaki’s books for a promotion. Should have been simple enough. But the publisher, Penguin, didn’t know how to handle it. They referred the company to Apple, which sold the ebook. Apple told them to buy 500 gift cards. Amazon and Barnes and Noble didn’t have any better solutions. Someone at the company ended up making 500 individual purchases on a credit card. The peculiarities of digital even stumped some of the digital trailblazers. That quantity issue can be confusing for those giant companies who don’t have a process for dealing with buying multiple quantities of a product that’s infinitely reproducible. It’s less a matter of quantity and more a matter of digital rights management and an appropriate way to pay for each copy. If you run your own store that’s a pretty simple solution. You could create multiple copy “packs” that are effectively a single digital file and a license to share it X number of times. You could give a quantity discount and even make a formula available and let customers set their own price and purchase as many licenses as they need. Kawasaki’s frustration prompted him to write APE: How to Publish a Book where he details how to create and sell your own ebook. But I have nothing to sell. That’s the common excuse. You hear about ecommerce and you just shrug. Why should I pay attention, I don’t have anything to sell? That’s where you’d be wrong. 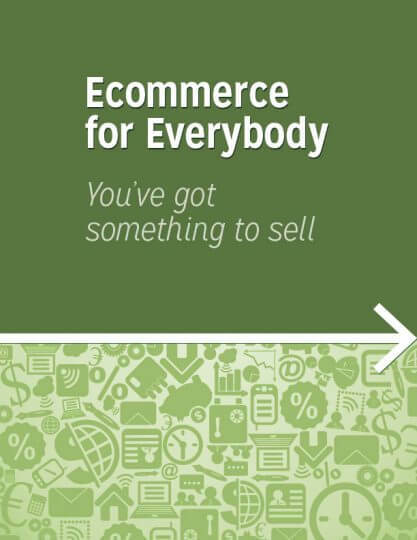 Ecommerce can be for everybody because everybody has something to sell. You just might not realize it yet. 1. Bloggers can sell an ebook collection of their best posts. 2. If you do any kind of speaking you could sell mp3s of speeches, presentations, sermons, etc. 3. If you’ve ever been successful you can find ways to package and sell that expertise. It might be a coaching or mentoring program. 4. You can sell access—maybe it’s an exclusive webinar, a chat, an opportunity to ask questions, etc. People would pay (or maybe make a donation to your nonprofit, if paying seems kind of weird) for the opportunity to pick your brain. 5. Anything with your logo. People like to be fans. Give them a way to wear their fandom like a badge of honor and support you at the same time. You might make those items just for kicks or to give away, but why not offer them for sale as well and let the fanatics show their love? 6. If you’ve got the right crowd and the right audience, you could sell mementos. It could be anything simple that has a connection to your organization. A sports team could sell a piece of the AstroTurf when a new stadium goes up. A band could sell discarded guitar pics or drumsticks. For racing fans there are all kinds of mementos that would otherwise be scrap, from used lug nuts to pieces of sheet metal from old race cars. It’s the kind of thing fans soak up. Just think about stuff you have that might otherwise be garbage but you could find new uses for, either as a way of recycling or by turning it into a memento. It’s a different way of creating something, more like recreating, but it’s just as valid. 7. Designers have a special power in today’s image-based, digital world: they can create all these incredible graphics people are eating up on all their devices. Photo-creation apps are hungry for fonts, text treatments and design components. Other designers will purchase reusable elements like vectors and fonts. Usually design is a service, but there are graphic creations that can easily be turned into products. And good design has never been so valued. 8. Photographers have always sold photos, but today the market is even wider than ever. Stock photography has grown and now organizations and even individuals are looking for photos to share online. It’s hard to believe, but you can sell photos for people to share on Facebook. Weirder yet, some people still buy physical prints. 9. Coders can create new products. Maybe it’s something you created for a client or internal use but it could have wider appeal. Maybe it’s a plugin or theme. Maybe it’s an app. Maybe it’s a new ridiculously addictive game to distract the world and be a drag on productivity, all while you rake in some cash. 10. Get your hands dirty and make stuff. Drawings, crafts, clay, you name it. Get creative and make something. You don’t have to be artsy either. It could be something incredibly practical, like directions. Maybe you write instructions for how to create stuff, whether it’s using LEGO pieces or office supplies. People have literally sold pixels online. You can sell anything. This summer my kids started to understand the concept of money. At 4 and 7 they’ve received enough birthday cash to realize money gets them toys. If they wanted more toys, they needed more money. I said no to a lemonade stand. But that didn’t stop them. I came downstairs to find they had set up shop on our front step, making money hand over first selling rocks to our neighbors and anybody passing by. And good money. Their expenses were negligible (“Hey, there’s a rock!”) and their pricing strategy worked pretty well (Pay whatever you want). They had found the perfect product. No, it wasn’t rocks. It was irresistible children as salespeople. The exact product proved to be of little importance over the next few weeks as my kids tried selling pet rocks, bookmarks, flowers, stickers and more. They even modified their sales pitch to be pay whatever you want or take it for free. They figured out what worked for them. And milked it. And so I apologize to my neighbors and everyone who passes by on the sidewalk if you’ve been guilted out of your pocket change by a precocious 4-year-old. And yes, my 7-year-old quickly learned to send her little brother to make the pitch. The point of that little lesson in salesmanship is to figure out what you can sell that makes sense for you. What would be a good fit for your company or organization? Think about what you do and what you’re good at. What you’re already doing or creating and how you might be able to repackage, repurpose or rework it. You don’t want to come up with a second job. You want something that compliments what you already do. You want something you can offer with a minimum of extra effort. It might be something you’re already doing for yourself, but could easily share with the world. It might not even be a product. It could be something else. It could be turning your product into a service, or your service into a product. It might mean taking a look at your current business model to see if there’s a way you can do something different. Maybe you do both going forward, maybe you change gears completely. That’s what happened with 37signals, the makers of Basecamp and other web-based software. They started out as a web development agency. They made websites for clients. But being geeks, they created their own internal project management system. They needed something that worked the way they wanted it to, so they built it. When their clients got a glimpse of it, they wanted it too. And so 37signals began to shift away from service-based client work and toward subscription-based software products. That kind of shift probably isn’t going to happen for everybody. But it’s possible. The goal is to find your thing. 37signals truly excels at creating and perfecting software like Basecamp. While they created great websites, it’s clear their talents were wasted on client work. So what might your something be? What can you sell? Well, that’s really only a question you can answer. If this were as easy as reading an ebook to find the answer, everybody would be doing it. But we can help with some suggestions. We’ve already talked about things you could sell. But let’s get more specific and look at various fields and types of work and what might make sense to sell. Writers should be creating ebooks. And not just capital ‘W’ writers. If you’re a writer of any stripe—this is not limited to professional writers—if you have a blog or do any kind of writing, you should be doing ebooks. Maybe you are a professional writer. But you’ve never written an ebook for yourself. You make good money as a copywriter. Why bother with something else? Because you can. Because of everything we’ve already talked about. You’re uniquely positioned, perfectly talented, and with today’s technology perfectly able, to create and sell your own ebook. Maybe you’re not a writer but you’re a company that has some written words. You’ve been running a blog forever. That’s ebook content just waiting to happen. Collect the best of the best and you’ve got an ebook. Maybe you don’t have a blog. But you have an idea. You want to spread it. Books are a great way to do that. It doesn’t have to be long or huge or massive. Physical books always had to justify their space (which often meant extra fluff). Nobody published a 40 page print book. But that’s just fine with ebooks (this book is barely 30 pages). Don’t let the misconceptions hold you back. Writers have words but artists have pictures, and a picture is worth a thousand words. So that means artists have 1/1000th of the work to do, right? Or something like that. If you’ve got artistic skills—drawing, graphic design, photography, etc.—there’s a wealth of things you can do. You can literally create and sell art. Painting after a long day’s work might be ideal stress relief and provide a little pocket money. Selling an actual painting might seem far-fetched, but slapping a design on a T-shirt or selling prints isn’t so crazy. And hello, Etsy is huge for a reason (but you should own your own shop… more on that later). Visuals are in high demand these days, whether it’s stock photography, fonts or even tiny designs. The Over app is creating a marketplace of fonts and designs for people to slap on their photos and share on social media. Weird? Yes. But so cool that you could make money from it. Those design elements you slap on brochures, never to use again? You could make some cash by repurposing those for use in apps like Over. Books are easy to make these days and you don’t have to be a writer. Ever heard of a coffee table book? People love amazing images and if you’re good at capturing them, you can find new ways to share them. You can make print books easily and there are also digital books that are more accessible (and gorgeous) on iPads and other tablets or ereaders. Oh, to be a developer these days. There are so many things yearning for good code, so many tasks longing to be simplified, so many options available with the proliferation of screens, WiFi and mobile. The work of a developer is no longer chained to a desk and an impersonal, immobile computer. There are so many things you can code for cash: apps, WordPress themes and plugins, snippets of code for various languages, add-ons and extensions for existing products, etc. There are tons of options and different niches you can join. All you need is a good idea, a vision for how it can take off and the determination to see it through. Maybe you’re not a writer, artist or developer. Maybe your skill is less tangible—you trade in knowledge and ideas. You’re an expert. It’s a skill that more easily lends itself to services, but there are ways you can turn that skill into a product. You might not think of yourself as a writer, but writing down your advice and insight is one of the easiest ways to turn your knowledge into a product. And if you really hate the idea of writing, hire a writer. Selling an ebook may be tried and true, but it’s not the only way to share your knowledge. There are other ways you can get your expertise out there, including podcasts or other audio files, video, training webinars and more. Access may be the product you want to sell. An hour of your time could be what people really want (just be careful to do it in a way that’s easily reproducible—selling an hour to one person severely limits your profits, but a one-hour webinar could give access to a larger group for the same time commitment on your part). Maybe what you sell isn’t so much something you create in order to sell, but it’s something you already created and use all the time. Maybe it’s a tool you use to do your job day in and day out. It worked for 37signals. Maybe as a writer you have a super in-depth style guide that puts the AP Stylebook to shame and you can package it as a starter style guide for corporations. Maybe you have a bunch of InDesign templates for various sized-brochures, complete with standard column breaks, footers, page numbers, etc. It’s basic stuff, but it saves you time on your projects and that might be valuable to beginning designers. Or maybe you have really unique calendar needs so you created a funky calendar and you’ve never seen anything like it (this six foot long linear calendar, for example). You could sell it. This idea of selling your tools might sound crazy, but people want an easier way of doing things. And they’ll pay for a good solution. Maybe what you really have to offer is connection. You already have products people purchase, but the extra thing you can sell is that special sense of belonging. It’s what creates tribes and what fans long for. We’re talking about mementos, swag, experiences and memories. It might be as simple as slapping your logo on a T-shirt. It might be recycling your cast offs, whether it’s guitar picks or lug nuts. It might be a photo or an autograph. Maybe you’re a nonprofit and you have nothing to sell. Ecommerce is still for you. You can use ecommerce to accept donations, take event registrations, even package and sell some of the content you have on hand, whether it’s conference audio or ebooks. Or maybe you want to give everything away for free. You can still use ecommerce. Free is great, but you should probably ask for email addresses so you can build your support community. With ecommerce you can set up all your products as free items and ask for an email address at checkout. You can still give your stuff away for free, but you can forge a stronger connection with your audience. Some of this work of trying to sell things you create is really about finding the unique angle. You don’t just want to write another book or create another line of T-shirts with funny phrases. You want to tap into a unique niche. Maybe you create a stock photography site for local communities (stock photography for Tulsa, Okla.!) or you build a WordPress theme specifically designed for food trucks. Sometimes making it work is all about finding your niche. What’s your niche? Well, that’s something you’re going to have to figure out. We’ve been asked this questions a number of times, so we wrote a post on How to Pick the Right WordPress Theme.Now we’ll talk about the specifics of making ecommerce a reality. How you create whatever it is you’re going to sell really depends on what it is. There are so many different options that creating it could be anything from writing an ebook to filming a training session. Whatever it is you create, you’ll need to put some thought, time and effort into it. If you’re going to be successful you can’t do anything less. This might be a secondary source of income but you have to give it a primary effort. We have an ebook full of advice on creating ebooks, How to Create Your First Ebook: From Initial Idea to Ready for Readers. A membership site is a unique way to package your expertise into a product. We’ve got an ebook for that too, Join the Club: How to Create a Membership Site. Pro blogger Darren Rowse primarily talks about earning money through his blog, but he also discovered the power of products when he started selling ebooks. $72,000 in one week is pretty good proof. If you’re thinking about webinars or training, our 15 Best Practices for Rockin’ Webinars ebook might be helpful. It’s more geared for free webinars, but the same tips apply. Check out the Smart Passive Income blog for all kinds of ideas about how to build money-making businesses that don’t require a lot of time. He talks about a lot of stuff besides selling stuff, but creating and selling products is certainly part of his income mix, including ebooks, apps and more. Once you create something you need a way to sell it. There are plenty of shops and marketplaces that would love to have your stuff: Amazon, eBay, Etsy, iTunes, etc. In some cases it might be good to be on those shops, but they shouldn’t be your primary storefront. Likewise freelancers, nonprofits and professional services should have their own billing process instead of relying on a third party to do it for them. You need to own your own shop. That’s how ecommerce works for everybody. You’re trying to make money for yourself, not Jeff Bezos and his shareholders. When you’re in someone else’s store, you play by their rules. They get all the control and make all the decisions. Sometimes that even means the prices you set. Amazon has strict rules for pricing, even changing their royalty rate for different pricing tiers. You also can’t offer your book cheaper anywhere else or they’ll match it. Want to send a discount to your email list? Nope. Want to drop the price for a few days? OK, but they’ll get around to lowering the price when they feel like it. When it’s your shop you can do whatever you want. Offer discounts for buying multiple products or a multi-copy discount for organizations. You can have extreme prices if you want, giving it away for free or charging hundreds of dollars (Amazon won’t let you charge more than $200, and that’s at the miserable 35% royalty rate). Want to release a new product tomorrow? You can’t do that with shops that require approval, like Apple’s Mac App Store. Their current average approval time is about six days, but a year ago it was 16 days. When you use someone else’s service you’re stuck with their rules, their process, the way they think it should work. That doesn’t work for everybody. When you sell an ebook on Amazon, the best royalty rate you can get is 70%. Amazon keeps 30% of your money. And if you want to charge more than $9.99, Amazon keeps 65% of your money. When you sell a book on your own site using a third party processor, the average transaction fee is 2.9% plus 30 cents (and if you go with a traditional merchant account you’ll get an even better rate). So a book you sell on Amazon for $2.99 means you get $2.09. But a book you sell on your own site for $2.99 means you get $2.60. 51 cents more. And that difference only becomes more pronounced when you charge more for your products. For a $9.99 ebook you’d pocket $2.41 more if you sold it yourself. That’s just ebooks. You’ll find similar math on every other marketplace out there. In some cases the math is closer, but you’ll still make more selling it yourself. Plus, you’re building your brand. When you run your own site the entire sales process is part of your site and helps build your brand. You’re not sending people to Amazon, Etsy, iTunes or anywhere else. That means you can forge a deeper connection with your audience. You can let them opt in to your email list. You can follow up with them. You want to form a long-term connection with your fans, and that happens best when you control the entire brand experience. You want them to remember you, not forget your name as they go back to Amazon. This is especially true for freelancers and services. Online billing is a way to make it easier and forge a stronger connection. You don’t get that if you outsource your billing to some third party service. You lose control of a major part of your relationship. That transaction can be a powerful way to build your brand, so don’t squander it by letting someone else do it. OK, it’s unlikely Amazon is going to close down shop and leave you high and dry. However, Amazon does change their policies and algorithms all the time. There was a time when their KDP Select program was a great way to give away your book and then rake in the cash. Some people made big money this way. But then Amazon changed things and now it doesn’t work nearly as well. If you’re relying on Amazon to sell your stuff and make you money, well, Amazon isn’t looking out for you. That’s a good way to put all your eggs in one basket, and if anything ever goes awry, you’re in trouble. Put your eggs in multiple baskets and keep things safe. There’s no reason to be exclusive. And definitely make sure you own one of those baskets so no matter what anyone else is doing, you can always keep your own lights on. Yes, you should own your own shop. That’s the way to go! Put stuff on your site and the other sites. Have your cake and eat it too. The biggest reason to do this is because, let’s face it, shops like iTunes and Amazon are huge. Those sites have learned how to sell and customers trust them. Sometimes you’ll make more money from being on Amazon simply because you’re on Amazon. You might pocket a lower amount, but you’ll get more sales as Amazon’s selling machine kicks into gear. Independent authors like Hugh Howey follow this model. He knows readers are on Amazon and that’s how his breakthrough book Wool was discovered and spread like wildfire. But he also sells his books on his own site, allowing him to make greater profits, build his community and offer special items (like autographed books). For authors it’s likely most of their money will come from traditional outlets. But selling books yourself can add a small but significant portion of income. Especially because the profit margins are higher. Why leave that chunk of change on the table? The other reason you should put your goods up on someone else’s site is if that’s the only way to reach customers. This kind of monopoly is rare, but it happens. That’s the state of the iOS app market today. There’s not a legitimate way to sell your app outside of Apple, so you’re stuck. Otherwise, yes, you need to have your own store. Do both if you want, but make sure you have your own outlet. Yes, you’ll need to do more of the work when you own your own shop. It’s not all easy. But that’s why you get to be the boss. Plus, there are plenty of resources out there to help you figure out what’s what. And just because you own the shop doesn’t mean you have to do everything yourself. There are plenty of great services that can handle small bits of your store for you and leaving you in charge. Outsource on your own terms. A software developer explored releasing an app outside the App Store, and despite his initial trepidation, found it was a great move. How Do I Build a Site? Hopefully we’ve convinced you of the importance of having your own site. It’s one of those foundational beliefs for us at iThemes. There are a lot of places you can have a site these days—including Facebook, Tumblr, Blogger, Etsy and many more—but you’re not in charge. Sometimes those companies disappear. Remember Posterous? Twitter acquired it in 2012 and shut it down in 2013. You never know what a tech company is going to do—even when they promise not to be evil (remember Google Reader?). So we always recommend building your own site. You’ll need three things: WordPress, an ecommerce plugin and a payment solution. That sounds complex—is there a simpler way to go? Yes, there always is. Building your own site with WordPress and an ecommerce plugin isn’t as hard as it sounds, but you can go easier. You could start with PayPal or Gumroad for simple ecommerce. These can be good solutions for single products. It might be a way to test the waters and see if this is really worth your time. But these simple solutions require sending people to a third party site. Your customers have to go to PayPal or Gumroad to complete the purchase, and research shows that can decrease your sales. Gumroad has some overlay and embed features, but you need to have SSL set up on your site. These are fine first steps for ecommerce, but if you’re serious you should look into an ecommerce plugin. You can still start basic, but you can also quickly scale up to a full-blown store. Just as it’s important to own your own site, you should own your own ecommerce solution as well. Simple: It’s so easy your mom can use it. You’re learning how to sell, not learning how to code. Powerful: While it is easy to use, it also packs a punch. By going the simple route you’re not sacrificing what you can do. Because WordPress can do a lot. Flexible: Part of what makes WordPress so good is its flexibility. With the help of plugins it can do all sorts of things, from ecommerce to social networking. Free & You Own It: When it comes to ownership, WordPress is all about you. It’s free and you own it. It’s that simple. You’re not putting your content in someone else’s system and paying for it. It’s your own site and you’re in control. WordPress is open source software, so there’s no tech giant ready to buy it out or shut it down. Do It Yourself: We’re big fans of the entrepreneurial spirit, if you haven’t already guessed. We think it’s important to do it yourself and retain control when you can. WordPress gives you that power. We wrote a whole blog series about Why WordPress. If you need help digging into WordPress, you can always check out our Getting Started With WordPress ebook. But once you have a site you’re not done. You need a way to sell your product. An ecommerce plugin allows you to turn your website into a store. You can add products to your site and give customers a way to browse your goods. The plugin creates a shopping cart and enables the checkout experience (though you’ll need a third piece for the checkout process to actually work). Ecommerce plugins come in all shapes and sizes, but they all let you own your own store on your own site. It’s a simple solution with one login for you, one site for your customers and minimal confusion. This is why we created the Exchange ecommerce plugin. We think you should have all the power on your site to create and run a store. You shouldn’t have to farm out your store to someone else or send customers off to a different site just to complete a transaction. Exchange is even free (you pay for the add ons), so if you’re doing a simple store you won’t have to spend a dime. Of course we created Exchange, so we’re a bit biased. But there are loads of other WordPress ecommerce plugins out there and we encourage you to check them out and find the one that works best for you. The ecommerce plugin builds your store online. But you still need to be able to accept payment. That’s where a payment solution comes in. You’ll need some sort of payment processor, whether it’s the standard combo of a payment gateway and a merchant account or the simpler solution of a third party processor such as PayPal or Stripe. The top-notch professional solution is a payment gateway paired with a merchant account. The payment gateway allows you to accept credit cards by talking to banks and approving transactions. Then the payment gateway sends those approved transactions to the merchant account for collection. Your merchant accounts goes to the various banks to collect your cash, depositing it in an account you can later transfer to your own bank account. A simpler approach is to use a third party processor such as PayPal or Stripe. These solutions combine the payment gateway and merchant account into one solution. It’s a simpler approach, but that comes at the cost of fewer features, less control and more cost. But it’s a lot easier to set up. However you go, the payment solution is what allows you to accept credit cards and ensure you get paid. There are a lot of options and it can get pretty complicated. For simplicity’s sake, if you’re doing less than $3,000 in sales per month, you can do good with a third party processor. Once you start making more than that you’ll want to go with a full blown payment processor and merchant account, which are more complicated to setup but will get you better rates. Those are the main components you’ll need to do ecommerce: WordPress, a plugin and a payment solution. You can keep it simple or make it as complex as you want. Here are a few extra options you might want that can add something more to your store. Download Management: Deliver digital files to your customers without making them freely available to anyone. Customer Pricing: Letting customers name their own price is a must-have for nonprofit donations. Guest Purchases: Let customers make purchases without creating an account. Discounts: Discounts, coupons and sales the way you want. Membership: Set up your own membership site (we’ve got a whole ebook that talks about membership). Recurring Payments: Steady income can give you stability over the long haul. This is an important feature for services and subscriptions. Physical Goods & Shipping: We launched Exchange to sell digital goods only and rolled out shipping options for physical products later. Some ecommerce plugins only do digital, which might be just what you need. But if you have physical stuff to sell, make sure your plugin handles it. You might want simple shipping or more complex options. If you’re ready to learn more about how to set up ecommerce, how to make the most of shipping and how to boost your sales, check out our ebook WordPress & Ecommerce: A Simple Guide for Selling Products Online. Once you create something and have a place to sell it you need to put some serious thought into how to roll it out. Just because you put out the ‘for sale’ sign doesn’t mean people are going to buy. You need to come up with a plan for how to roll out your idea. This is a good time to call in favors. Reach out to some of your trusted contacts and cash in your chips. Give them an easy way to help you promote your launch and beg them to do it. Build some buzz beforehand. You don’t want to put too much effort into the pre-launch or have it drag on too long, but you do want to build some anticipation. Consider a short-term deal during the launch. Offer your product at a generous discount for the first few days. Give it a specific time limit to create a sense of urgency. Reach out to your list multiple times during the launch. Let them know it’s coming, announce the launch, give a reminder and warn them when the deal is about to expire. You’ll have to find the right balance so you don’t overwhelm your list, but remember that you’re also offering them a great deal. You’re not just trying to sell them, you’re trying to save them money. Consider throwing in some free extras. The Smart Passive Income blog has some good tips on how to offer bonuses. There are lots of great stories about how to launch a product out there. Some of them can be a bit overwhelming, like Darren Rowse and his $72,000 launch. Or Nathan Barry’s $36,000 in 24 hours. Keep in mind that these guys have huge audiences. Don’t expect to match their results, but you can learn what worked for them. Also remember that these things take persistence. Darren Rowse didn’t launch his blogging book from nothing. He’d been building an audience for five years before he had that incredibly successful launch. You might not be able to launch to incredible sales and huge success. That’s OK. Your product might require a slow build, racking up sales over time and accumulating significant sales in its own right. That’s pretty great too. Just remember that doing ecommerce doesn’t have to be an overnight success. It’s not your main source of income, so don’t worry about it. Let it build up slowly, be patient and watch your income grow. Remember this when you feel like giving up. This is going to be hard work and some days it’s going to look like a failure. You’ll have to work hard at it, keep it up and not give in. We never said this would be easy. Once you’ve got your product launched and you’re in to the normal rollout, you need to make sure you’re doing everything you can to keep your product selling. You can’t keep up the frantic pace of the launch forever, but you do need to make sure you’re encouraging additional sales. Reviews: Ask for reviews and feedback about your product and add choice quotes to your sales page. Reviews and ratings have a huge impact on Amazon and the same principle applies on your site. Give a Sample: Give a taste of whatever it is you’re selling. Maybe it’s a free sample chapter or a trial offer or a free song. Give your customers a glimpse of what you’re selling so they can judge the quality and will be sold on the whole thing. Nathan Barry has a great post on the best way to make that free offer. Make It Visible: Make sure it’s highly visible on your site. You can’t just bury it in the menu or expect people to visit your store. Put it in the sidebar on every page. Or create a pop up modal window reminding people about it. You can set iThemes’ BoomBar to only show up for first-time visitors or to reappear after a month, so it can be highly-targeted and avoid being annoying but still make sure people don’t miss it. Repeat, Repeat, Repeat: It’s easy to miss a single tweet, so make sure you keep a steady stream of updates going about your product. Several a day might be overkill, but you should be able to mix them into your content stream without being overwhelming. A lot of these tweets can be scheduled at once and reused. As long as the reused tweets are mixed in with new content and you don’t overdo it, most people won’t notice you repeated a tweet from a few months ago. Offer Value: Be sure to add value when you’re pitching your product. Don’t just continually ask people to buy. Throw out something valuable, whether a quote or insight from the book or something to hook people. A tweet with a good quote is much more likely to be retweeted than a quote asking people to buy the book. Get People Talking: Ask people to talk about your product. Hit up some bloggers or steady social media users and ask them to write about your product. Ask them to review it, offer free copies for a giveaway or offer yourself up for an interview. This can be a good way to introduce your product to a new audience, increase your SEO and keep your product selling over time. If you’re a freelancer or professional pushing your payments online and not creating a store, then much of this launch advice obviously doesn’t apply. Unless you’re turning your service into a product, you don’t have something to sell (though maybe you should!). But you do have a new payment process and that’s something you should think about when you roll it out to your clients. Change can be scary so don’t just spring it on them. Let Them Know What’s Coming: Give them a heads up that you have a new system starting and when you expect it to go live. This can be as simple as an email explaining what you’re rolling out. Answer Questions: Anticipate questions and problems and lay out the answers. You should probably have an FAQ page linked from your payment page or even your invoice. Be Flexible: While online payments are a great new solution, not everybody likes new solutions. You might need to allow people to still pay their invoices offline. If you have some hold outs and don’t like dealing with paper checks, you could encourage them with a discount for paying online. If you must force them into online payment, at least give them a transition period and ease them into it. It’s a new world out there. You don’t have to rely on the gatekeepers anymore. You can harness the power of ecommerce for yourself, whether you’re a local business, a nonprofit or a professional. And no matter who you are there are tremendous opportunities to create something and sell it.Every kid knows the appeal of opening a lemonade stand. As wise, cynical adults, we know the hassle and complete waste of a lemonade stand. But sometimes tweaking the traditional idea—like selling rocks—can find success. Ecommerce is the lemonade stand with a few tweaks—and it can work. It has the general appeal and opportunity for everyone, but thanks to the Internet it can actually reach an audience and provide some income. You may not be retiring on your lemonade stand, but it can’t hurt to try.